The SnackCubby – Multi-purpose Reusable Snack Bag & Ice Pop Mold (Set of 2) is on sale for $6.99 at Amazon right now. These look like a great way to carry snacks around for the kids PLUS they also can be used to make homemade ice pops! ✔ REUSABLE = SAVINGS – 2 Pack – No longer do you need to spend money on plastic bags for snacks & other items. Fits a variety of snacks like granola, almonds, pretzel sticks, gummy bears, trail mix, & more. 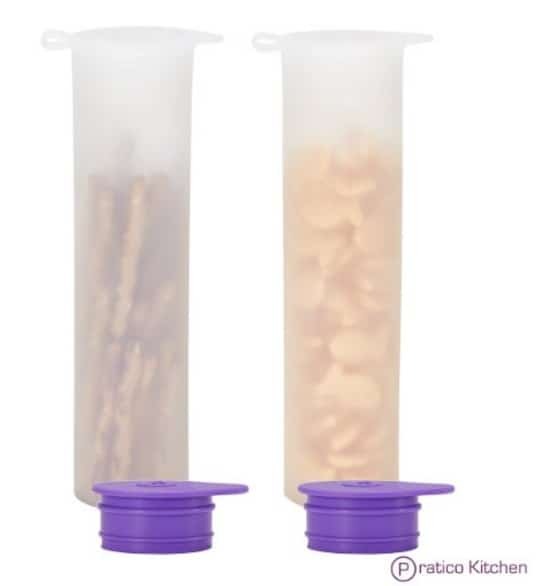 ✔ EASY SNACK PORTION CONTROL – Each SnackCubby holds 254 ml (8.5 ounces) or approximately 1/4 of a plastic sandwich bag which is great for making sure you don't overeat your favorite snacks. ✔ TRANSLUCENT & SLIM DESIGN – Translucent color allows you to quickly see what's inside & slim tube design (6.9 in x 1.7 in) makes it easy to stand up on it's own in a fridge. Also easy to put in a lunch box, gym bag, or backpack. ✔ FOOD SAFE & EASY TO CLEAN – Made with premium BPA-free FDA-approved food grade silicone which is freezer safe & dishwasher safe.